Last time we regaled the glorious garden jewel, Muhlenbergia capillaris Muhly grass, as a perfect ornamental for southerners in, this, our second spring. Its affects profound, even as those clouds of purple haze fade, we cherish the beauty it supplies to the garden. As nature has a way of drawing our attention to the perkier players in the garden we turn to Hibiscus acetosella, False Roselle to visit her attractive characteristics as another autumn feature. Previously thought to be maple-leaf hibiscus on this blog, I'm almost positive this great pass-along is the False Roselle also known as African Rosemallow and Cranberry Shield. Any experts out there know the difference? Numerous cuttings have been rooted and shared as they easily make new plants without applying any special methods. Quite by surprise this wondrously textural foliage shrub returned this year. She is most loved for her hard-to-come-by (in this zone) almost burgundy-black-bronze stems and leaves. As much as her lovely maple-like leaves are admired, especially when the sun illuminates their brilliance, it's worth noting her tendency to overpower her neighbors at peak. With that in mind and feeling a bit ruthless this past spring, after a particularly harsh winter, I dug up all remaining roots from these plants. Further reasoning at the time had to do with thoughts of a not-so-admirable tendency for lanky branching and brittle limbs. Staking the central stalk and soft-pruning its extensions can produce a stronger and bushier plant if the gardener is inclined to give it some extra attention late summer. Alas, these hardy perennials do have a habit of re-seeding. Seedlings began sprouting mid-summer. Again, several of them were plucked up as they randomly landed in awkward locations. As you can see my recall at summers' end when deciding to allow a few emerging seedlings, was not all that keen. Their habit of speedy growth results in a bit of a sprawling enormity within just a couple of months to full maturity. This (above) lovely specimen is nearly blocking the arbor walk-through from the circle garden to the wildflower garden. The birdies haven't minded the extra cover drooping over their feeder as they've made good use of hiding in the branches. Such are the unplanned happenings in any thriving habitat. Every living seed longing to flourish. 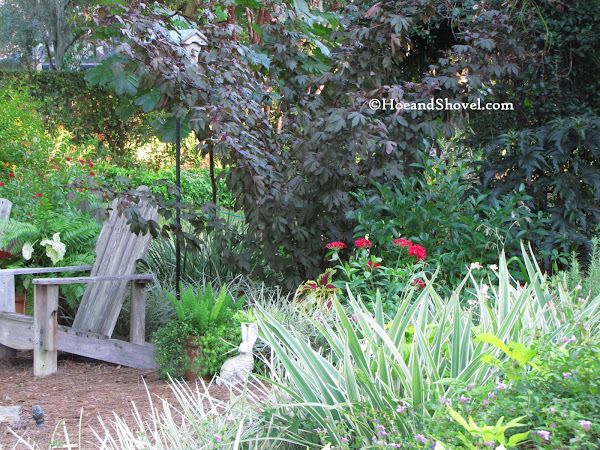 When all is said and done these elements of the unexpected add to the wonders of gardening and ultimately continue to inspire this gardener. This is one of those rare plants in which the flower takes second place to the foliage ~~ in some hearts anyway. The pink blooms blending-in as camouflage could almost go unnoticed if not for the swarm of buzzing critters nectaring deep in their tubular throats. Only lasting for a day, each bloom withdraws in a graceful fashion. Every morning several more buds, lined up along the stems, will shine their pink stripey-faces to the sun to make this gardener glad they surprised me by insisting on a spot in this garden for another pleasing fall display. I do hope all my fellow Floridians (as well as those far and wide) are making the most of these glorious autumn days. November has been nothing short of spectacular in my neck of the woods. Thanks as always for sharing your lovely garden. I'm in Pinellas and am glorying in this wonderful weather. I'm dying to get out and plant in some bare spots but I have no idea if now is an OK time of year. I especially love all your color; too lovely! Hi Meems! I am not familiar with this plant. Its flowers are very pretty and remind me those of a tree mallow. Meems the harsh winter done mine it and it did not return this year, sigh. Yes the weather has been wonderful and yes I have been trying to make the most of it! Meems, your identification of H. acetosella is correct. Your poetic descriptions are as lovely as the plant itself! 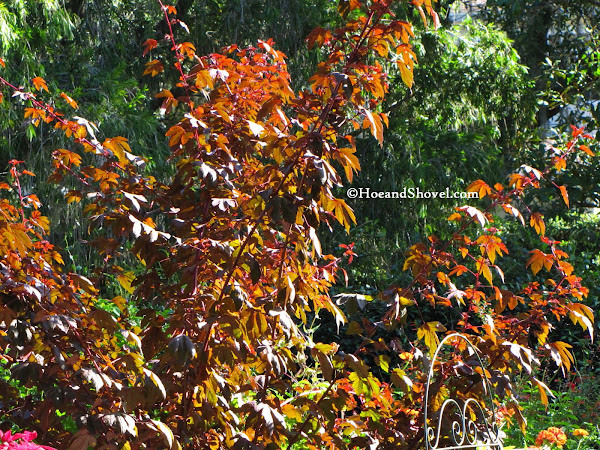 Very beautiful autumn color for our Floridians! I love the flowers as much as the foliage. Yes, I am enjoying the weather very much, and I am looking forward to my year end days off, and more time in the garden! Such pretty color is worth a little whacking back to keep it in bounds I think. Love seeing the light through those leaves. I sure hope my little cutting will spew forth lots of seeds so I can enjoy this beauty in my garden. I just love the foliage all season long. Too bad I don't have it in my garden right now because the warm fall would certainly have given it every reason to flower before the first frost! I can understand your desire to leave a few of these seedlings in the garden, Meems, in spite of their tendency to grow to such large proportions and take over. 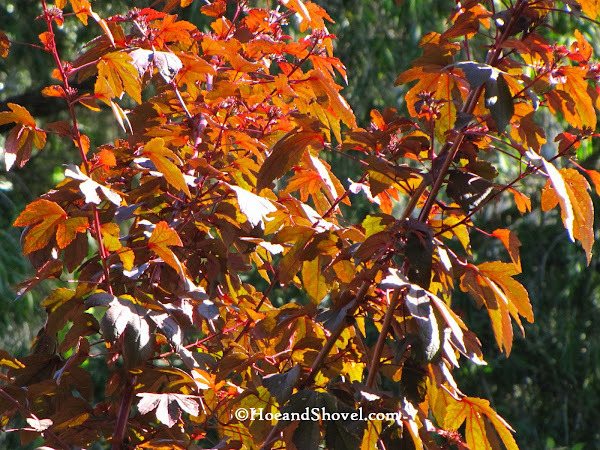 Those beautiful leaves remind me of a Japanese Maple, and the flowers are lovely as well. One self-sown Malva Zebrina grew very large in my garden this summer, persevering through several hard frosts and providing very welcome purple striped blooms after most other plants had succumbed to the cold. We waited a long time for those blooms (held close to the stem and peeping through large, Hollyhock-like leaves) to open, but what a gift so late in the growing season! A very happy and blessed Thanksgiving to you and your family dear Meems! Beautiful plant! 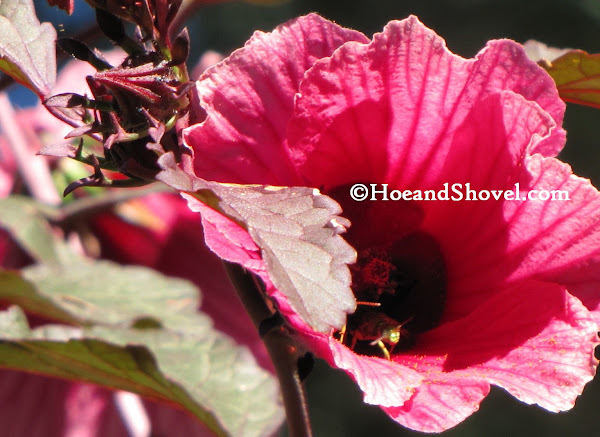 I don't know if you read grower jim's blog but he featured a whole bunch of hibiscus relatives, including this one! I love how the leaves are reminiscent of Japanese Maple.